Si Agent Yogi Felemon Ruez kinsa mao karon ang pangulo sa PDEA ning lalawigan namahayag nga niining tuiga magsugod na sila sa ilang mga kalihukan alang sa pagtutok sa ilang kampanya ug pagsikop niadtong mga nagpayohot sa ginadiling drugas. Dugang pa ni Ruez nga ang Bohol usa sa mga modelo nga probinsa sa Pilipinas bahin sa kampanya sa ginadiling drugas. Matud pa niya aduna na silay kasayoran kon kinsa kining mga sindikato sa lalawigan nga mao karon ang nagpayohot sa mga ginadiling drugas. Usa usab sa ilang pagahimoun mao ang pagbisita ngadto sa mga kalongsuran aron sa pag-edukar sa katawhan. Iyang gipadayag nga aduna na silay kasayoran sa pipila ka mga lungsod nga diin kusog ang pagpayuhot sa ginadiling drugas dinhe ning lalawigan. TAGBILARAN CITY - Twenty-six young Boholanos are now qualified to be part of the Samahang Kabataan Volunteers Club (SKVC), the extending arm of the Sangguniang Kabataan (SK) Bohol Federation. According to John Torralba, the SK chief of staff, this year, 26 volunteers passed the interview and screening. They are: Mary Grace Ramada, Jerranica Anna Cespon, Rafael Kit Solis, Glaiza Marie Lapez, Mary Jessamyn Arcales, Ian Orillos, Rachel Ann Pilvera, Janice Jandayan, Jonathan Tocmo, Marc Bruce Villarojo, Margelyn Moncano, Mary Joy Peñaranda, Dexter Borbanu, Marie Louise Oppus, Ronald Boniao, Carlo Jay Palma, Neil Bien Golosino, Maria Eulaica Raya, Ellagere Vale Daquio, Angeline Baldapan, Daisy Balangkig, Ma. Melody Nistal, Madelyn Maninantan, Mariam Daisy Rosales, Ma. Ariene Daling and Jaype Piquero. Most of the volunteers are student and church leaders and community volunteers. They will undergo trainings and seminars to enhance their leadership skills and their hearts. In this fast-paced world, it’s surprising there’s time for them to attend classes, do homework, take part in extracurricular activities, yet despite busy schedules, many young people are concerned about what’s going on in their neighborhoods and communities, and are looking for ways to get involved. “I am happy to learn that there are still youth who are giving their best without expecting something in return. The many acts of selflessness here would ensure that the spirit of volunteerism is not lost,” SK national president Jane Censoria Cajes said. 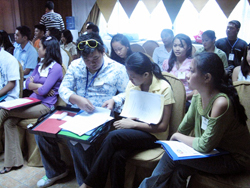 The first batch of SK volunteers who called themselves “Bolahan” were accepted in September 2008. 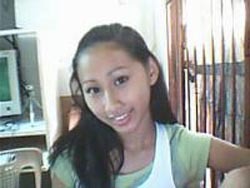 To know more about the programs and projects of SK, you can visit www.skbohol.com or you can call 411-5914. TAGBILARAN CITY – Sama sa mga sunoy nga nagpanikad na aron makiglabok sa sabong, duha sa mga garbosong Bol-anong boksidor mipadayag nga redi-to-payt na silang duha sa ilang pagbalik sa ring. Silang AJ “Bazooka” Banal ug Cesar “Czar” Amonsot mibutyag sa ilang kaandam pagbangon gikan sa mga kaparutan sa ilang karera sa pamoksing. Ang duha gitakda nga mosaka balik sa ring karong umaabot Enero 31 (Sabado) sa usa ka boxing extravaganza nga gibansagang “They Are Back” nga ipahigayon sa carpark sa Island City Mall, Tagbilaran City. Si Banal, kinsa adunay kartadang 17W-1L-1D (14KO) makigkontrata sa Indonesian nga superflyweight champion nga Nouldy Manakane. Si Manakane nagkubot og 17W-7L-1D (8KO) nga record. Samtang si Amonsot makigsangka kang Zoel Fidal nga usa usab ka Indonesian nga dunay 16W-6L-2D (7KO) nga kartada. 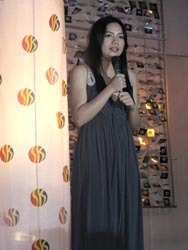 Mao ni ang unang away ni Banal human kini gipaluhod ni Rafael Concepcion sa Panama sa ika-10 nga round kaniadtong Hulyo 26, 2008 didto sa Cebu Coliseum. 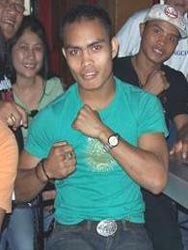 Una usab kining sangka ni Amonsot human sa iyang kapildihan sa Australyanong Michael Katsidis kaniadto pang 2007. Sukad niadto, wala pabalika sa Amonsot sa pakigboksing tungod sa damyos nga naaguman sa iyang ulo, ug basin mo-grabe na hiunon kung magpadayon pa kini sa pag-away. Apan bag-o palang, gi-deklara sa mga doktor nga pwede na si Czar nga mopadayon sa iyang panginabuhi human sa duha ka tuig nga pagpaalim. 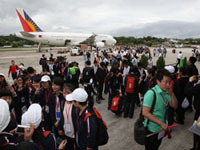 Secondary school students delegation from Sichuan, China Earthquake affected areas arrives in Tagbilaran, Bohol Tuesday Jan. 13, 2008 to visit Tarsier Farm in Loboc, and Chocolate Hills in Carmen, Central Bohol. Chinese middle-school students from earthquake-affected areas in Sichuan Province of China take pictures of the tarsier, the world's smallest monkey, during their visit to Bohol on Tuesday (Jan. 13). TAGBILARAN CITY - Once again, business and tricycle operators are expected to queue the City Hall Atrium for the renewal of their mayor’s permits and licenses starting January 5 until the 30th. Last November, Archt. Walter Toston, City Administrator, as directed by City Mayor Dan Neri Lim, called a meeting of the department heads and representatives of the offices directly involved to ensure the smooth flow of the renewal process. To avoid the rush and penalty, the Office of the City Mayor - Permit and License Division headed by Antonia Acierto is reminding all business operators that renewal of business permits processed after January 20 shall be subject to a surcharge of 25% of the amount of tax, fees and other impositions due plus an interest of 2% per month of the unpaid taxes, fees or charges including surcharges until such amount is fully paid. The following are basic requirements to be complied with: previous Mayor’s Permit (photocopy), barangay clearance from the barangay where business establishment is located, community tax certificate (cedula) from Tagbilaran City (photocopy), tax clearance from the City Treasurer’s Office, and affidavit of sales from the City Treasurer’s Office. On the other hand, the lease contract of all operators who are renting space, building, lot, etc. and a copy of real estate lessor’s permit from the owner of the building, space or lot will be required on a case-to-case basis. Business establishments will be required of the: barangay clearance from the barangay where business establishment is located; photocopy of the community tax certificate (cedula) from Tagbilaran City; police clearance from Tagbilaran City, and health certificate from the City Health Office. For the registration of tricycle units, the operator has to comply with the following: certification as to his or her residency and good moral character from punong barangay concerned, certificate of registration (original and 2 photocopies), official receipt (original and 2 photocopies), barangay clearance from Tagbilaran City, community tax certificate from Tagbilaran City, tax clearance from City Treasurer’s Office, 2 pieces 2x2 pictures, franchise (1 photocopy), and police insurance from any carrier insurance. In case the operator is also the driver, the police clearance (Tagbilaran City) and health clearance (City Health Office) are the additional requirements. For drivers (extra or regular), the requirements are: barangay clearance, community tax clearance and police clearance from Tagbilaran City, tax clearance (City Treasurer’s Office), health clearance (City Health Office), professional driver’s license (original and 2 photocopies), 2 copies 2x2 pictures and certification of seminars attended from the City Traffic Management Office. The tricycle unit must be brought to the City Hall for inspection. All tricycle operators are advised to come to the Office of the Permit and License Division for the requirements. For franchise applications, certification as to his or her residency and good moral character (from punong barangay concerned), certificate of registration (original and 2 photocopies), official receipt (original and 2 photocopies), policy insurance from any carrier insurance, 2 copies 2x2 pictures, stencil (engine and chassis numbers), inspection slip, community tax certificate (Tagbilaran City), traffic violation clearance (City Traffic Management Office) and affidavit of undertaking. New applications for business permit and license will be entertained beginning February 2009, with the following requirements: community tax certificate from the City Treasurer’s Office (original and 1 photocopy), barangay clearance from barangay where business establishment is located, property index number from the City Assessor’s Office, DTI registration from the Department of Trade and Industry (original and 1 photocopy), and an affidavit of capital and tax clearance from the City Treasurer’s Office. 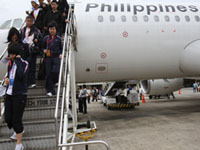 An ocular inspection will be conducted by the inspection team. Other requirements (case-to-case basis) are SEC registration and by-laws (photocopy) for corporations and partnerships, Cooperative Develop-ment Authority registration and by-laws (photocopy) for cooperatives, license to operate from Bureau of Food and Drugs, Camp Crame, Department of Education, Department of Environment and Natural Resources (Environmental Clearance Certificate), Department of Tourism, among others; lease contract for operators who are renting building, spaces, and lots; real estate lessor’s permit from the owner of the building, space, lot rented (1 photocopy), certificate of occupancy from the owner of the building, if the building is newly constructed or renovated. Employees of business establishments will also be required of the barangay clearance (from barangay where business establishment is located), photocopy of community tax certificate and police clearance (Tagbilaran City) and health certificate (City Health Office). TAGBILARAN CITY - The long wait is over. After a series of field evaluation and deliberation, the search for the 10 Outstanding SK Chairmen of Bohol will be known on Dec. 30 at the Metro Centre Hotel. The 20 semi-finalists who joined this year’s search are Cathy Grace Bonsay, San Roque, Baclayon; Jary Rose Baclayo, Casbo, Guindulman; Michelle Boncales, Baybayon, Mabini; Luisa Boctot, Basacdacu, Albur; John Brian Galendez, West Lungsudaan, Garcia Hernandez; Desideria Hemilo, San Antonio, Sagbayan; Lieu Galon, East Ulbujan, Garcia Hernandez; Lennin Baay, Hagbuyo, San Miguel; Marven Mapang, Dusita, Sierra Bullones; May-Ann Anaña, Lubang, Buenavista; Lecil Lebita, Bayong, Guindulman; Fatima Edquilang, Cawayanan, Mabini; Marivic Maghuyop, Can-agong, Sikatuna; Sherilyn Llemit, Cayam, Garcia Hernandez; Zosie Domasin, Bolod, Panglao; Verjel Maputol, Biabas, Guindulman; Jay-Rem Cano, West Poblacion, Garcia Hernandez; Ryan Cabarrubias, Tapal, Ubay; Gerwin Yudelmo, Poblacion, Inabanga; and Jo-Ann Gasatan, Tontonan, Loon. 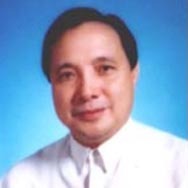 The search for Ten Outstanding SK Chairmen is to choose the top 10 leaders who made an impact in their community through legislation and governance, environment conservation and preservation, anti-drug programs and activities, health services, education services, livelihood projects, community immersion and promotion of physicals fitness through sports. “As the year 2008 is about to end, we see to it that our SK chairmen have contributed something in their respected barangays with projects in their one year of service,” SK president Jane Censoria Cajes said. The prizes are cash incentives, personalized plaque, SK Medal, and all-expense paid trip to Manila for a courtesy visit to the Malacañang Palace, the Senate and the House of Representatives. The Outstanding SK Awards which is initiated by SK Bohol Federation headed by Cajes is on its second year and the only in the entire Philippines. TAGBILARAN CITY - Vice Gov. Julius Caesar Herrera said people should be reminded that Christmas is a message of hope. “This is perhaps the most favorite event to Christians because it is celebrated with joy and feasting,” he said. Herrera however noted that in recent years the observance has lost some of its glitter. He said people blame this on the worsening economic crisis that has deprived them of the usual trappings they equate with Christmas. “That should not be the case,” the vice governor said. Herrera said people especially Christians should remember that the message of Christmas is the message of hope. “Jesus Christ came to earth to deliver God’s message that He desires to restore His lost creation,” he noted. 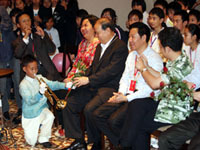 The vice governor said people should realize that “there is not much difference with the first Christmas”. “Then and now, we see conflict, crisis, suffering and exploitation,” Herrera pointed out. TAGBILARAN CITY - Nagkauyon ang mga sakop sa Sangguniang Panlalawigan nga kinahanglan mopasar og balaud ang duha ka balay balaoranan sa Kongreso nga ipahigayon ang Constitutional Convention karong tuig 2011 aron pag-usab ubang mga probisyon sa Batakang Balaod. Ang Sangguniang Panlalawigan pinangulohan ni Bise Gobernador Julius Caesar Herrera mipasar sa resolution no. 2008-605 kaniadtong Desyembre 23, 2008 didto sa Flamingo Suite 2, Bohol Tropics Resort ning Dakbayan sa Tagbilaran. Ang maong reso-lusyon nagkanayon nga giila sa Sangguniang Panlalawigan nga kinahanglan usbon ang ubang mga probisyon sa Konstitusyon, ug mayorya sa katawhan supak sa Charter Change karon panahona. Dugang sa maong resolusyon nga dili maayong magdungan ang pagpili sa mga delegado sa Concon ug ingon man ang mga kandidato pagka presidente. Kinahanglan usab nga ang usa ka delegado sa Concon dili paryente sa mga kasamtangang sakop sa Kongreso. Ang maong reso-lusyon ipadala usab ngadto sa mga sakop sa Sangguniang Panlalawigan sa tibuok nasud alang sa ilang suporta. Ang mga sakop sa Sangguniang Panlalawigan nga miuyon sa maong resolusyon mao sila si Hal. Julius Caesar F. Herrera, isip Presiding Officer; Hal. Cesar Tomas M. Lopez, M.D, Senior Member; Hal. Ester Corazon J. Galbreath, Hal. 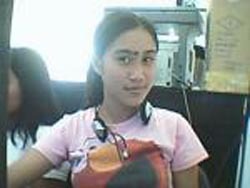 Josephine Socorro C. Jumamoy, Hal. Alfonso R. Damalerio II, Hal. Jose E. Veloso, Hal. Josil E. Trabajo, Hal. Aster Apalisok-Piollo, Hal. Concepcion O. Lim, ABC; Hal. Jane Censoria R. Cajes, SK. TAGBILARAN CITY - IT has been an age-long dilemma face by senior citizens in the country. But now, senior citizens found an ally in the Sangguniang Panlalawigan (SP) in their quest for privileges given to them by law. The provincial board passed Resolution No. 2008-575, urging all establishments particularly drug stores to implement the 20% discount privilege to all senior citizens under the Senior Citizens Act without time limit. Drugstores and business establishments here are warned. If they fail to give 20% discount to legitimate senior citizens in Bohol, they will likely be slapped with lawsuits. “We will be preparing cases against these establishments which do not give the 20%,” board member Atty. Aster Apalisok-Piollo told her colleagues in the SP during its recent regular session presided over by Vice-Gov. Julius Caesar Herrera. TAGBILARAN CITY - VICE Gov. Julius Caesar Herrera yesterday declined to comment on the possible entry of actor Cesar Montano into the gubernatorial derby. “There is nothing to comment on,” he replied when asked about Montano’s noted visibility during the Baclayon fiesta activities. The actor, who made an unsuccessful senatorial bid in last year’s election, has been widely rumored to be casting a moist eye on the governorship in the 2010 polls. With Gov. Erico Aumentado no longer eligible for reelection, Herrera has loomed as the obvious candidate along with the two graduating solons, Representatives Edgar Chatto and Roberto Cajes. Montano however has been doing the rounds in recent months, fuelling speculations that he is also interested in the gubernatorial post. Sought for comment on the possibility of Montano’s entry into the derby, Herrera said no one has a monopoly of good intentions. “To aspire for public office is the right that all citizens are entitled to,” he added. The vice-governor said that if Montano will indeed throw his hat into the political ring, it will make the derby more exciting. TAGBILARAN CITY - A WEEK after coming short of declaring his gubernatorial bid in 2010, Vice Gov. 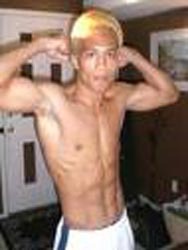 Julius Caesar Herrera played coy when asked about his plans for 2010. “There is a time for that,” the vice governor responded when asked to comment on his next political battle. Herrera is serving the last of his three terms as vice governor and speculations are rife that he would move up the ladder to the post to be vacated by Gov. Erico Aumentado. “People who have no public accountabilities have the luxury to talk about their political plans, one thing I don’t have,” he disclosed. Talk about his gubernatorial aspirations grew stronger as Herrera moved around the province during the advent season. “I don’t have the choice. If people don’t see me personally, they will say I’m good only during the campaign. If I go around, they say I am campaigning,” he noted. Herrera said there is nothing new about his trips to the towns because he does it as often as he can. TAGBILARAN CITY - The provincial government of Bohol will soon acquire a new fleet of brand new heavy equipment to replace the aging ones following the approval last Tuesday by the Sangguniang Panlalawigan of an appropriation of PhP147,460,000 through a Hold Out loan with the Land Bank of the Philippines. To materialize this, the provincial board passed a Resolution authorizing Gov. Erico B. Aumentado to represent the province and enter into a Hold Out Loan Agreement with the said bank relative to the acquisition and purchase of the equipment. The SP presided over by Vice-Gov. Julius Caesar Herrera also passed a third measure creating a trust fund or “special account” with the provincial treasurer’s office. The approval was reported by the Appropriations Committee chaired by Herrera during the regular session on Dec. 16, 2008 at Bohol Tropics Resort Club in this city. Surveillance camera in all banks compulsory? TAGBILARAN CITY - Security camera system in all banks, malls, why not? The Sangguniang Panlalawigan of Bohol is poised to enact an Ordinance requiring all banks or financial institutions, including malls or commercial firms, in the province especially in the city to invest and install close circuit television (CCTV) and electronic alarm system. The provincial board appeared persuaded after the Philippine National Police of Bohol led by provincial director P/Sr Supt Edgardo C. Ingking made an explanation about the security system during its pre-session last week. Ingking said in the SP’s Peace and Order committee report that CCTV is based on Memorandum Circular No. 620, series of 2008, “Revised Rules and Regulations on Banks Protection” issued by Bangko Sentral ng Pilipinas. The said report was signed by board members Ma. Fe Camacho-Lejos, committee chairperson; Cesar Tomas Lopez, peace and order member; Alfonso Damalerio II, vice-chair trade/industry committee vice-chair; and Ester Corazon Galbreath, trade and industry member. TAGBILARAN CITY - The Sangguniang Panlalawigan has finally realized that protection and preservation of the endangered Philippine tarsier (tarsius syrichta) in Bohol is of overriding importance as it approved last week twin measures including an Ordinance prohibiting the display and possession of what is considered as the smallest primate. The other is the Resolution urging the DENR “to stop the issuance of wildlife farm permits, special permits and any other permits allowing the possession, display for viewing for commercial or business use, or any other purposes” of the tarsier. The joint environment-tourism committee report rendered by board member Alfonso Damalerio II and approved by the SP body also recommended to keep a “centralized” sanctuary for tarsier conservation program in Corella town. 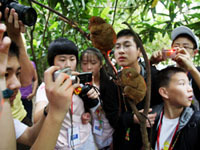 The approval of the measure was triggered following the proliferation of the possession of and display of the tarsiers for a fee from tourists who want to have a glimpse of the primate. Officer-in-charge Provincial Environment and Natural Resources Officer (Penro) Nestor Canda assured that Environment Secretary Lito Atienza, who visited here thrice already, vowed to fully support whatever the provincial government would like to do on the tarsier. TAGBILARAN CITY - In time for Christmas, the government gives a gift that may go a long way for lifeline power consumers, including Boholanos through the Katas ng VAT. The gift comes in the form of P500 government power subsidy for lifeline consumers who are good payors, Bohol Electric Cooperative Assistant general manager Engr. Virgilio Fortich explained over the weekly Kapihan sa PIA Thursday. The Kapihan discussed concerns on the government power subsidy and invited BOHECO and Bohol Light Company Inc. to elucidate on Pantawid Koryente: Katas ng EVAT, a topic that concerns lifeline power consumers. By lifeline, the government means residential consumers whose power consumption last May was below 100. The government decided to hand down the subsidy to help dampen the impact of high oil prices that cause disastrous volatility in prices of basic commodities, including power consumers. With BOHECO as partner in the government program, the Bohol power provider would effect the power subsidy in December, or at a time when people are expected to be consuming and thus paying more. The peak usage of power would be in December where people put in additional consumption with the Christmas lights. But the subsidy, according to Engr. Fortich would not be transferable, non-convertible to cash and would only be creditable to the monthly billings beginning December until the whole amount is used up. Of the P500 subsidy, he means that if a consumer uses up only about 20 kilowatts per month, the subsidy would be stretched until the whole amount is credited and is left with a no-balance. In that case, if a consumer qualifies to avail, and if by December his billing is more than P500, he would only pay the balance. And in other case, if the December billing consumption is only about P100, then the consumer can still stretch his subsidy until he uses up the whole amount. Over this, BOHECO institutional services department manager Ernesto Mascarinas reiterated the call for consumers to go to the nearest Boheco collection station to get their credit memos. The credit memo allows consumers to know if the qualify to the program or not. TAGBILARAN CITY - MIDUMILI paghatag sa ilang komentaryo ang Provincial Environment and Natural Resources Officer kalabot sa kontaminasyon sa tubig nunot ning pagputol sa ilegal nga koneksyon apan ianam-anam ang pagpabuhagay sa tubig didto sa dagat panahon lamang sa ting-ulan. Si PENRO Nestor Canda nagkanayon nga mga illegal nga connection ang gilantaw sa DENR, agig tubag sa pangutana ni Atty. 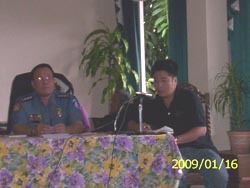 Salvador Deputado atol sa gihimong governors report kaniadtong Byernes. Si Deputado mipadayag sa iyang pangutana kabahin sa kahimtang sa mga connection nga karon hingpit nang giputol sa DENR nga matud pa adunay mga kabalaka nga kon ianam-anam pag pagbuhagay ang mga tubig gikan sa gisira nga connection sa panahon nga kini pagaabrihan panahon sa ting-ulan, dili ba mas dako ang kontaminasyon kay kini napondo naman sa dugay nga panahon ug kon maayo ba usab nga anam-anam na lang kini ug pabuhagay ngadto sa dagat. Subay sa maong pangutana mipadayag usab si Canda nga usa kini sa ilang gilantaw nga sitwasyon apan ang DENR dili una mo komentaryo niini sa pagkakaron ila una nga humanon ang pagsira sa mga illegal nga mga connection. Dugang pa ni Canda nga karong simanaha hingpit na nga mahuman ang gihimo nila nga pagpangsira sa mga illegal nga connection sa ingon dili na kini makahatag pa og dugang kontaminasyon sa kadagatan sa Tagbilaran Bay ug ngadto usab sa kasilinganan nga lungsod. TAGBILARAN CITY - Gipahigayon ang culmination Program sa mga partisipante sa Alternative Learning Skills kaniadtong petsa 20 ning bulan sa Desyembre didto sa Barangay Hall sa K of C Drive sakop sa Poblacion II ning Dakbayan. Ang Pangulo sa LUDABI-Bohol Chapter nga mao si Mrs. Carmensita Mae Arcay usa sa pinasidung-gang dinapit. Siya mipasupot og mensahe ngadto sa mga mitapos sa training nga giulohan ug Lamdamanong Pahimangno ngadto sa mga tinun-an. Ang programa gi-sugdan sa Invocation ni Mrs. Loreta Bolongaita, gisundan sa Pambansang Awit ni Mrs. Rizalina Peligro, Welcome address ni Mr. Virgelio Balon, Statement of purpose ni Rizalina Peligro ug gipresentar usab ni Mr. Noel Abrico ang mga mitapos nga mga partisipante sa maong pagbansay-bansay. Si Kagawad Mariquit D. Oppus mihatag usab sa iyang pakigpulong atol sa maong kalihukan samtang pagkahuman sa maong rograma gisunod usab ang ilang Christmas Party. FOUR councils of the Knights of Columbus, Bohol South received the Father Mc Givney Awards during the awarding rites held on Dec. 6 at the DepEd Ecotech Center, Lahug, Cebu City. Visayas State Deputy Dionisio R. Esteban, Jr., gave the awars in behalf of the Supreme Council of the Knights of Columbus. Provinvial Deputy Jorge D. Cabalit of the Bohol South received the awards in behalf of the four councils. The recipients of the awards were the Birhen sa Barangay Council No. 8362 of Cogon, Tagbilaran City; Council No. 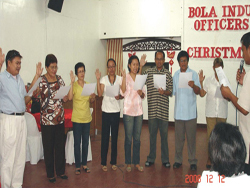 11373 of Loboc, Bohol; Council No. 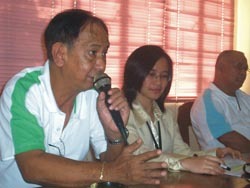 10088 of Jagna, Bohol; and Council No. 13872 of Conception, Loay, Bohol. The Father Mc Givney Award is given annually in honor of the founder of the Knights of Columbus, Fr. Michael Mc Givney to give due recognition to councils which have attained a 100 percent growth in the membership quota. The Knights of Columbus is an international fraternal, service organization. The Knights of Columbus is the biggest Catholic lay organization in the world with over 1.7 million members residing in the United States, Canada, South America, and the Philippines.